Notice: All plugins on this page are made for the PC platform with Jeff McClintock`s SynthEdit and use the default skin. Use at your own risk. Roland does not endorse this plugin. I created it simply because i once owned one, and wanted it still as part of my arsenal, and now yours too. It comes with a LFO modulator with random step voltage and can be used to modulate the oscillator, the filter, and the pulse width. Also includes an invert switch for the envelope, which can modulate the filter and pulse width, as well as the amplifier. Includes the *.se1 file for end-user modifications. This little ditty is a switchable state variable/Moog filter. A MIDI input allows the cutoff to be altered by MIDI note information, including pitch and velocity. Also, there`s a clocked randomness function just for good measure. Useful for timbral decadence. 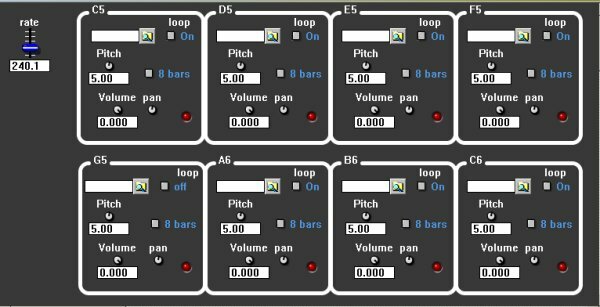 A simple 8-file drum machine (WAV only) that can tempo sync loop on the fly. Synthedit users by atomic_afro [ Join Now | Ring Hub | Random | << Prev | Next >> ] This site is a member of WebRing. Hey, wanna check out some musick on the postdawn nurseries record label? Go here.